We specialize in cakes for all occasions – from elegant wedding cakes to fun party cakes, our cakes are created especially for you. We offer tiered cakes, layer cakes and sculpted cakes, all made to order. Our cakes are available in buttercream and fondant varieties. Because we take our time with every order, we do suggest advance ordering for all orders of at least two weeks. We try our best to accommodate rush orders but cannot guarantee. Please contact us for information on pricing, tastings and consultations. (*) Denotes a Gluten Free version is available. Premium cake flavors/fillings and out of season fruit selections will incur additional fee. Fresh fruit & fruit preserve fillings paired with vanilla swiss meringue unless another chosen. 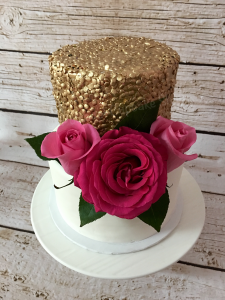 Our custom cakes are priced by intricacy of the design and serving size. Everything is built to your specifications so pricing without the details is near impossible, as it ranges greatly. For a starting reference, our single tier custom cakes start at 150.00, 2 tiers start at 200.00, 3 tiers at 300.00, 4 tiers at 450.00. Wedding Cakes start at 500.00, Sculpted cakes start at 350.00, and Smash cakes start at 30.00 (Please note: at this time, smash cakes are available only for clients also booking party cake). NEED A WAY TO DISPLAY YOUR TREATS? Please inquire about different towers, displays, stands and platters we have available for you to rent.